Numbers in brackets show the current ranking, which is based on results from the last two World Championships. *Teams listed without a ranking are participating in their first Men´s World Floorball Championships and will receive a ranking after the final round event is played. Starting from 2014, all teams, apart from the organiser, must qualify for the Final Round. 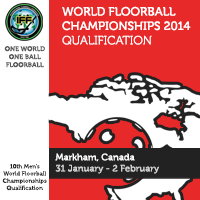 In 2014, there will be six regional qualification events to determine the participants of the 10th Men´s WFC 2014. In each qualification group the teams play each other once. i) The two best teams from this qualification group will qualify.